Jake is made of a soft knit with a hand painted soft sculpture face and embroidery cotton hair. His shirt has hand painted detailing. 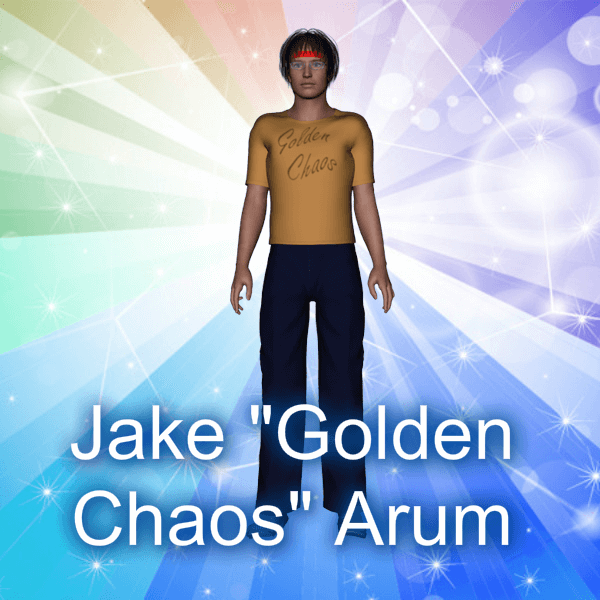 Jake “Golden Chaos” Arum is perhaps most noted for his “Chaos Clutch” sleeper hold. A champion medium-weight wrestler and loving father who believes most strongly in self-defense and trained his daughter well. Jake Arum’s forced retirement came during a championship match. Just before he could get his opponent into his Chaos Clutch, the Keres attacked. Although his injuries weren’t disabling or life-threatening, it was suggested that he retire early so he could spend time with his family and only do exhibition matches from time to time to keep up appearances. Jake decided he’d go out a champion, did one final championship match after recovering from the Keres attack and upon winning, announced his retirement. His retired life left him free to handle household work. Even though his wife knew his daughter’s secret the two had decided it was safer if he didn’t know and led him to believe Arora had a new job right out of high school that kept her very busy. With that, he decided it best he take care of the cooking and cleaning around the house, since he’d be home after his regular workout schedule all day. Fabrics subject to availability and may vary.